AP Physics B carries 4% of the total points in this section while AP Physics C carries 10%. Note that bold face characters are used to represent vectors. F = q(v×B + E) where E is the electric field. dF = I dℓ×B, treating the elemental length dℓ as a vector. F = µ0I1I2/2πd, where µ0 is the permeability of free space, ‘d’ is the separation between the conductors and I1 and I2 are the currents in the conductors. τ = nIAB sinθ, where ‘n’ is the number of turns in the coil, A is the area of the coil, I is the current in the coil and θ is the angle between the area vector and the magnetic field vector. Remember that the area is a vector which has magnitude equal to the area and direction perpendicular to the area. 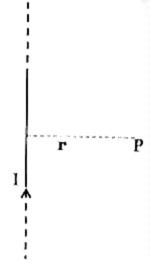 This magnetic field is perpendicular to the plane containing the current element and the point P.
The length of the current element also is treated as a vector dℓ of length dℓ with its direction same as that of the current. B= µ0nI, where ‘n’ is the number of turns per metre of the solenoid. ∫B. dℓ = µ0 [I+ ε0 (dφE/dt)], where ε0 (dφE/dt) is the displacement current resulting from the rate of change of electric flux φE. ε0 is the permittivity of free space. In the next post we will discuss questions in this section.